Habit: Shrub, < 2 m. Stem: bark gray; branches few, generally flexible, generally ascending; twigs densely hairy. Leaf: evergreen; petiole 2--5 mm, hairy; blade 15--20 mm, ovate to round, thick, soft-hairy, abaxially flat to concave, base, tip rounded to acute, margin finely toothed, flat to rolled under, veins not prominent. Inflorescence: 1--6-flowered, soft-hairy; pedicel 2--4 mm. Flower: generally unisexual; hypanthium +- 2 mm wide; sepals 4; petals 0, 4. Fruit: 2-stoned, 6 mm, red. Unabridged Note: Sp. not known from Baja California or Arizona as reported in USDA Plants Database based on note in Abrams, L. 1960. An illustrated flora of the Pacific States. 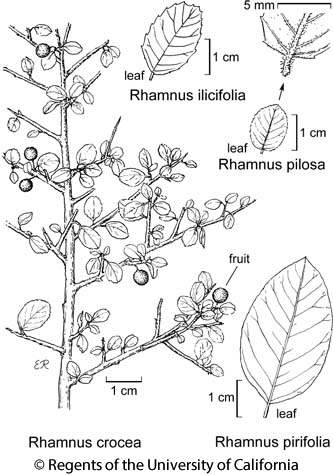 No specimens support the claim, but some specimens from RSA-POM approach Rhamnus pilosa morphologically. Citation for this treatment: John O. Sawyer, Jr. 2012, Rhamnus pilosa, in Jepson Flora Project (eds.) Jepson eFlora, http://ucjeps.berkeley.edu/eflora/eflora_display.php?tid=41071, accessed on April 25, 2019.
s PR (San Diego Co.). Markers link to CCH specimen records. Yellow markers indicate records that may provide evidence for eFlora range revision or may have georeferencing or identification issues. Purple markers indicate specimens collected from a garden, greenhouse, or other non-wild location.